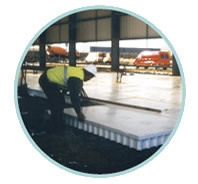 Cellcore is designed to support the weight of a given thickness of concrete plus a live load allowance of 1.5 kN/m2, without creep compression during the 16 hour curing period. The total of these is defined as the SAFE LOAD and is expressed in kN/m2. When ground movement occurs, the Cellcore honeycomb will compress and buckle when a pre-determined load is reached. Defined as the FAIL LOAD, in kN/m2, it is the maximum load that will be transmitted to the foundations. The variables which determine the performance of Cellcore are the ‘leg depth’ of the panel (selected to accommodate the predicted amount of ground movement at the Fail Load), and the compressive strength of the legs which is defined by the density or the thickness of the polystyrene honeycomb. This flexibility of product design allows selection of the optimum grade of Cellcore to suit the designer’s particular requirements. TYPE CC for use beneath piled beams and pile caps, incorporates a heavy-duty polypropylene top. In certain circumstances a protection layer of concrete blinding may be required. TYPE CP for use beneath suitably reinforced concrete slabs. 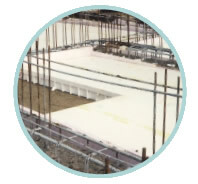 It includes a 50mm thick polystyrene top, protected by a 2mm thick polypropylene sheet that provides a high degree of insulation. This can be improved by increasing the thickness of the top. water table, work can continue without reducing its effectiveness. On sites where water pressure is a potential problem or the water table is expected to rise, special grades of Cellcore are available with drainage apertures. To assist specifiers, the tables below detail the standard Cellcore range.